Out of favour forward Alex Kiwomya has joined National League side Chesterfield on loan until January. The 22-year-old has made just 16 appearances for Doncaster Rovers since arriving from Chelsea in the summer of 2017. He missed the entirety of the first half of last season after contracting the rare auto-immune disorder Guillain–Barré syndrome. 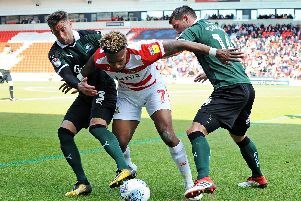 Kiwomya featured in four games at the start of this season but has since fallen way down the pecking order, behind John Marquis, Mallik Wilks, James Coppinger, Alfie May, Paul Taylor and Alfie Beestin. He could make his debut for the Spireites in front of the BT Sport cameras at FC Halifax Town on Saturday (5.15pm).